Summary: Mükava is the world’s first ergonomic reading table that allows for reading of books, magazines, documents or any type of tablet or phone in any home or office setting. 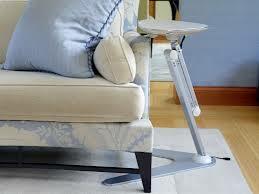 It is different from a tablet holder in that after you are finished reading, your Mükava turns into a useful side table. The Mükava stand can be adjusted to a more than 12 possible positions. Mükava pads work with most protective cases seamlessly, removing the need to remove the protective case like with most tablet holders and devices can be swapped out on a Mükava faster than any alternative on the market today. I have a very unique product to share with you! It's a new concept that I happen to love! It's by a company called Mukava and it will make your reading time even better. It's a tablet floor stand and adjustable table. I was fortunate enough to receive one for review in the brushed steel -- see picture above. But it's also available in a gold tone too. When I first took this stand out of the box, my initial reaction was that it was rather heavy. I don't know that the picture conveys just how solid this table is... it's actually a piece of furniture albeit one that you can still take from room to room. My second reaction was that there was virtually no assembly required! For someone like me who isn't too handy, that's a great thing. Once I set up the floor stand, I was really impressed. It seems like Mukava has thought of everything. 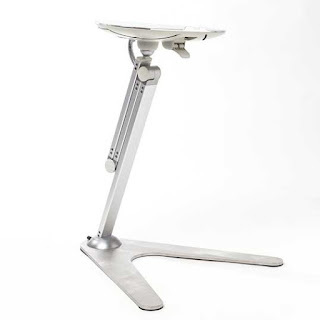 The stand is adjustable and can serve as a side table or a speaker podium (or anything height in between.) In addition, the actual part that holds your reading material is adjustable as well. It can tilt to almost any angle that will be most comfortable for you. And then I discovered the little things that make this Mukava Tablet Floor Stand extra special! There are two USB ports for charging your devices and a USB light. In addition, there are book bands that fit underneath which you can use to keep your book or magazine in place. Finally, there are magnetic pebbles which you can use to keep papers in place. You might be wondering how this metal plate can hold your tablet or your phone. Well, Mukava has thought of that too! They have included pads that "stick" to the plate so your device can't slip and fall. These pads aren't actually sticky with chemical adhesives. Rather they have a patented adhesive system that consists of millions of micro suction cups to maintain adhesions between the pad and your device. With normal care, these pads should last for years. Mukava includes multiple pads in two sizes so you shouldn't really ever have to worry about replacing. When I first started using the Mukava Tablet Floor Stand and Adjustable Table, I admit I had a reservation or two. First, I had to get used to the adjusting mechanism. 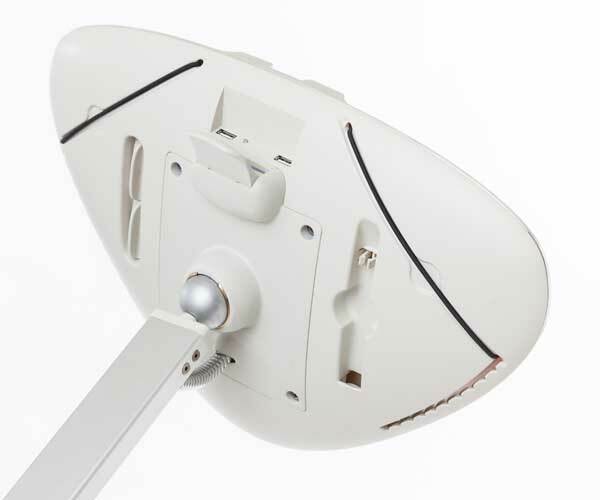 There is an adjustment lever under the reading surface that allows you to adjust the height. You have to squeeze the lever with one hand while pulling the reading surface out and then up with the other hand. This took me a little while to do effortlessly. Secondly, the Mukava contemporary design doesn't really match my decorating style. It almost looks like a robot with its sleek design, which is super cool, but I don't think I want it sitting out in my family room. Having said that, I think it's ideal for a teenager's bedroom, a dorm room or even an office setting. The Mukava Premium Tablet Floor Stand and Adjustable Table isn't cheap. It retails for $299 but I think it has its definite benefits. If you are looking for something with similar characteristics but costs less, then the Mukava for Monitor Arm might be the product for you. This product attaches to a counter or table, is much smaller in size, and costs $129. Mukava is also a company that understands the importance of giving back, and literacy is their priority. Their company, Project for Adult Literacy and Schools, LLC is focused on two causes -- adult literacy and building a school for homeless children in Jakarta, Indonesia. Twenty percent of their total profits go to their causes, with The Literacy Volunteers of Washington County and The Yayasan Kawula Peduli each receiving ten percent. Each table sold allows them to provide school books for one child for two years and valuable resources for adult literacy education for one adult learner. Gotta love that! I think Mukava is going to change the way the world reads! Check out their FAQ page to learn more and see instructional videos. I love the concept but get what you mean about the modern design. I bet Vance would love something like this! I absolutely love the idea of this, and the modern design doesn't bother me (though my house isn't very modern). I bet I'd use something like this a lot, but I'm not sure it's in my budget. I like this table very much. I plan on moving but think I'll get one when I get settled. What a nifty product! They really did think of everything. Kid Konnection: Happy Birthday, Cupcake! Kid Konnection: What Pet Should I Get?